Seamless and cropped with 3/4 length sleeves, Marion is a fun, fast knit. The cardigan is almost entirely stockinette, but cables along the v-neckline keep things interesting. 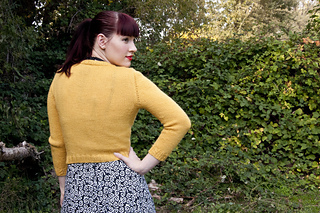 The body is knit in one piece, starting with the upper back. The fronts are picked up from the back cast on edge, and everything gets connected when the underarms are cast on. Sleeve stitches are picked up from the armholes, and short row shaping is used to create set-in sleeves. 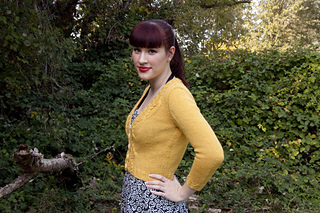 The cardigan will fit best when worn with 1-3 inches of negative ease. The pattern includes both charts and written instructions for the cables.